© 2017 Malehmir et al. Salmonella is known as one of the most important causes of gastrointestinal disease in the world. Quinolones and fluoroquinolones are used successfully in the treatment of salmonellosis particularly for infections that have become resistant to several antibiotics. But non-susceptible isolates to quinolones have been reported in several countries. The data are limited about the prevalence of quinolone-resistant isolates in our country. Therefore, this study investigated the plasmid-mediated quinolone resistance genes in Salmonella enterica isolated in Children's Medical Center in Tehran during 2014-2015. Salmonella isolates were isolated and identified using standard microbiological methods. Antibiotic susceptibility testing and screening of Salmonella strains resistant to quinolones were performed according to the CLSI guidelines. The molecular investigation was done using specific primers for detection of qnr genes including: qnrA, qnrB and qnrS, by polymerase chain reaction. Overall, 92 (66.6%) strains were resistant to nalidixic acid. None of the strains showed resistance to ciprofloxacin. Out of the 92 nalidixic acid resistant strains, 52 (56.52%) harbored qnrS genes, 15 strains (16.30%) had both qnrA and qnrS genes. Two (1.1%) isolates were positive for qnrB gene. Twenty four (26.08%) nalidixic acid resistant isolates did not have any qnr qens. The results of this study show high prevalence of resistance to nalidixic and qnr genes in Salmonella isolates. Plasmid nature of this type of resistance poses an increased risk of dissemination of quinolone resistance between Salmonella and non-Salmonella isolates circulating in hospitals environments. Keywords: Nalidixic acid resistance, Qnr, Salmonella enterica, Quinolone, QnrA, CLSI. The infections caused by enteric pathogens comprise second commonest medical problems after respiratory infectious disease . Salmonella, is among the most prevalent and endemic food borne pathogens in Iran . Salmonella is one of the most important genera of Enterobacteriaceae, causing a wide variety of different diseases in society. In Kaufmann-White classification, each serotype is considered a genus based on the antigenic lipopolysaccharide (LPS) structure of cell surface (AgO) and new proteins (AgH), accordingly, 2,600 genus was suggested for this organism [3-6]. Over 90% of serotypes causing intestinal illness in humans are related to Salmonella typhi, S. typhimurium, S. enteritidis and S. infantis . Usually recovery from non typhoidal disease can be achieved without antibiotics. The antibiotics are used in patients suffering enteric fever, septicemia and also in high risk persons, including patients with a weak immune system, malnutrition and malignancy. Ampicillin, chloramphenicol and co-trimoxazole, have been considered for the treatment of salmonellosis; however due to increased resistance of these compounds, usage of fluoroquinolones such as ciprofloxacin and cephalosporin is increased in adults and children [7, 8]. Fluoroquinolones are broad-spectrum antimicrobial drugs which are used for the treatment of clinical salmonellosis infections in elderly or immunocompromised patients as well as patients suffering enteric fever, invasive disease or long-term carriers of Salmonella [8-10]. The increase of antibiotic resistance in developing countries’ patients has become an important concern . Acquisition of antibiotic resistance occurs through several mechanisms  including chromosomal mutation, resistance transfer to other bacteria through the transposable elements such as plasmids and transposons, decrease in the cell wall permeability of antibiotics, antibiotics enzymatic inactivation, and efflux pump mechanisms for removing antibiotics . Rapid detection and molecular epidemiology investigation of resistance genes in bacteria are extremely important [14-17]. We aimed to investigate the plasmid-mediated quinolone resistance genes in Salmonella enterica isolated from Children's Medical Center in Tehran during 2014-2015. The study was conducted on clinical specimens recovered from patients who were suspected to Salmonella infection admitted to Children's Medical Center in Tehran during the years 2014-2015. Bacterial isolation and identification were done according to the standard microbiological and biochemical methods. After performing biochemical tests for Salmonella confirmation, serotyping was performed to determine the O and H antigens with specific antiserum. Antibiotic susceptibility testing for nalidixic acid (NA 30μg) and ciprofloxacin (CP 5μg) was done by modified Kirby-Bauer method. Escherichia coli ATCC 25922 were used as a control in the experiment. Table 1. Primers used for detection of qnrA, qnrB, qnrS and their characteristics. DNA was extracted by boiling method. The primers used in this study are listed in Table (1) . PCR was performed for the amplification of qnrA, qnrB, qnrS genes in thermocycler machine under the conditions shown in (Table 2). Table 2. PCR condition for detection of qnrA, qnrB and qnrS genes. Antibiotic susceptibility testing results showed that 92(66.6%) strains of Salmonella enterica were resistant to nalidixic acid. None of the investigated strains showed resistance to ciprofloxacin. PCR amplified the expected amplicons with sizes of 417bp, 516bp, and 526bp for qnrS, qnrA and qnrB genes, respectively. Fig. (1) shows amplified target genes from representatives Salmonella isolates harboring different qnr genes. Overall, out of 92 nalidixic acid resistant Salmonella strains, 52 (56.5%) had qnrS gene. The genes qnrA and qnr B were observed in 28 and 2 strains respectively. Among nalidixic acid-resistant strains, 15 (16.30%) strains harbored qnrS gene together. Only one strain contained qnr B gene. Fig. (1). Detection of three genes qnrS and qnrA and qnrB in representative strains of Salmonella enterica isolated from clinical specimens. Well 1: a qnrS positive isolate. Well 2: one of the clinical isolates with qnrA. Well 3: one of the clinical isolate with gene qnrB. MW: molecular markers (DNA Ladder 100 bp). In the past, Ampicillin, chloramphenicol and co-trimoxazole, have been used for the treatment of salmonellosis, but today, fluoroquinolones such as ciprofloxacin and cephalosporin are used for adults and children respectively . The strains resistant to nalidixic acid have a reduced sensitivity to fluoroquinolones [18, 19]. In recent years, several cases of treatment failure with fluoroquinolones have been reported in patients infected by Salmonella strains resistant to nalidixic acid and reduced sensitivity to ciprofloxacin. Unfortunately, their number is increasing [20, 21]. In Nigeria, Akinyemi et al. showed that 42%, 43%, 42%, 47%, 51%, 57%, 56% and 59% of Salmonella strains recovered in the years 1997-2004 were resistant to nalidixic acid respectively . Similar results were reported by Ghaderi et al. in which 67.2% Salmonella strains were resistant to nalidixic acid . In a study conducted in Spain by Prats et al. showed 10% increase in resistance of nalidixic acid from 0.1% to 11% over seven years . Compared to previous studies, our results show the increasing rates of Salmonella strains resistant to nalidixic acid in Tehran. The rate of resistance to nalidixic acid can be important, because fluoroquinolones have been used as a chosen antibiotic in the treatment of infections caused by Salmonella. Antibiotic therapy using fluoroquinolones, may not be successful in people who were infected by nalidixic acid resistant Salmonella strains [20, 24]. Ferrari et al. showed plasmid- depended quinolone resistance, by gene qnr and gene aac (6 ') Ib-cr in 126 Salmonella strains isolated from poultry and humans food sources during the years 1999 to 2007 in the state of Paraná (Brazil). Overall, 88% and 23% of strains showed resistant to Nalidixic acid and reduced susceptibility to ciprofloxacin respectively. QnrA1 gene was shown in a S. enteritidis strain . Ghaima et al. in 2016, accomplished a study to determine the presence of qnr genes in 40 strains of Salmonella isolated from stool samples of patients in Iraq. They found 30 isolates (75%) had multidrug-resistant (MDR). Based on the results of PCR, 15 (37.5%), 22 (55%), and 11 (27.5%) isolates had qnrB, qnrS and qnrA respectively. 10 cases (25%) contain qnrA, qnrB and qnrS . Lunn et al. determined the mechanism of plasmid- depended quinolone resistance in 41 collected Salmonella strains in 2010. None of the isolates were resistant to ciprofloxacin, while 41.5% of the strains showed resistance to nalidixic acid by mutation in gyrA. Although qepA, qnrB, qnrS1, were found in 4 isolates, but the expression of this gene was not accompanied by reduced susceptibility to quinolones . Compared to previous studies, the rate of resistance to nalidixic acid is increasing among clinical strains of Salmonella enterica that poses a warning alarm for antibiotic therapy of infections caused by this organism in Iran. The molecular method used in this study was able to show the genetic nature of resistance to quinolones among Salmonella strains under the study. Plasmid nature of this type of resistance poses an increased risk of dissemination of quinolone resistance between Salmonella and non- Salmonella isolates circulating in hospitals environments in our country. We would like to thank from the "Clinical Research Developement Center of Baqiyatallah hospital" for their kindly cooperation. This study was supported in part by a grant from "Clinical Research Developement Center of Baqiyatallah hospital". Ranjbar R, Soltan Dallal MM, Pourshafie MR, et al. Serogroup distribution of Shigella spp. in Tehran. Iran J Public Health 2004; 33: 32-5. Karami A, Ranjbar R, Ahmadi Z, Safiri Z. Rapid detection of different serovares of Salmonella entrica by multiplex PCR. Iran J Public Health 2007; 36(2): 38-42. Brooks G. Adelberg’s medical microbiology. New York City, New York: Estados Unidos da América: The Companies McGraw-Hill 2007; 22. Ghaderi R, Moradi Bidhendi S, Khaki P. Occurrence of multidrug-resistant Salmonella enterica serovar Enteritidis isolates from poultry in Iran. Arch Razi Inst 2016; 71(1): 43-9. Ranjbar R, Salimkhani E, Sadeghifard N, et al. An outbreak of gastroenteritis of unknown origin in Tehran, July 2003. Pak J Biol Sci 2007; 10(7): 1138-40. Amini K, Salehi TZ, Nikbakht G, Ranjbar R, Amini J, Ashrafganjooei SB. 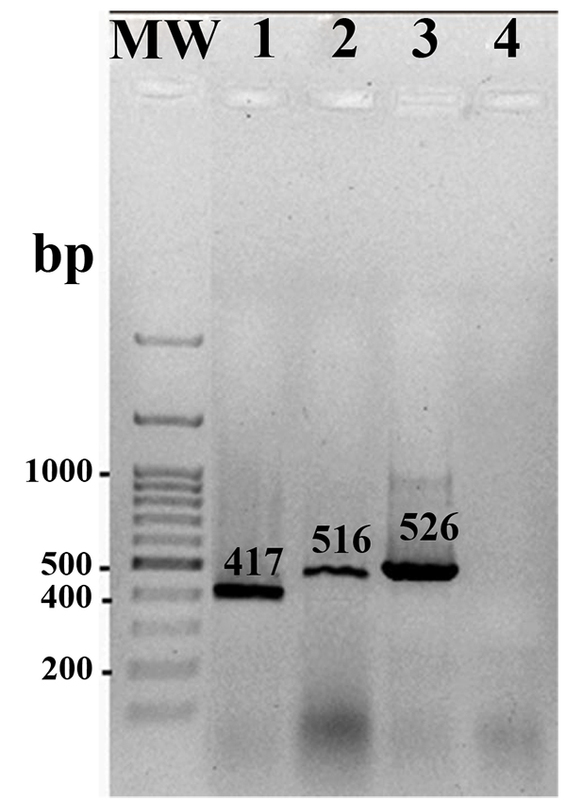 Molecular detection of invA and spv virulence genes in Salmonella enteritidis isolated from human and animals in Iran. Afr J Microbiol Res 2010; 4(21): 2202-10. Ranjbar R, Giammanco GM, Aleo A, et al. Characterization of the first extended-spectrum β-lactamase-producing nontyphoidal Salmonella strains isolated in Tehran, Iran. Foodborne Pathog Dis 2010; 7(1): 91-5. Baghbani-arani F. Molecular Typing of Salmonella paratyphi B and Salmonella paratyphi C Isolates from Clinical Samples in Iran. J Fasa Med Sci 2012; 2(1): 19-25. Ranjbar R, Ahmadi M, Memariani M. Multiple-locus variable-number tandem repeat analysis (MLVA) for genotyping of Salmonella enterica subspecies enterica serotype Infantis isolated from human sources. Microb Pathog 2016; 100: 299-304. Ranjbar R, Giammanco GM, Farshad S, Owlia P, Aleo A, Mammina C. Serotypes, antibiotic resistance, and class 1 integrons in Salmonella isolates from pediatric cases of enteritis in Tehran, Iran. Foodborne Pathog Dis 2011; 8(4): 547-53. Naghoni A, Ranjbar R, Tabaraie B, et al. High prevalence of integron-mediated resistance in clinical isolates of Salmonella enterica. Jpn J Infect Dis 2010; 63(6): 417-21. Mirza S, Kariuki S, Mamun KZ, Beeching NJ, Hart CA. Analysis of plasmid and chromosomal DNA of multidrug-resistant Salmonella enterica serovar typhi from Asia. J Clin Microbiol 2000; 38(4): 1449-52. Ranjbar R, Naghoni A, Farshad S, et al. Use of TaqMan® real-time PCR for rapid detection of Salmonella enterica serovar Typhi. Acta Microbiol Immunol Hung 2014; 61(2): 121-30. Ranjbar R, Naghoni A, Yousefi S, Ahmadi A, Jonaidi N, Panahi Y. The study of genetic relationship among third generation cephalosporin-resistant Salmonella enterica strains by ERIC-PCR. Open Microbiol J 2013; 7: 142-5. Ranjbar R, Karami A, Farshad S, Giammanco GM, Mammina C. Typing methods used in the molecular epidemiology of microbial pathogens: A how-to guide. New Microbiol 2014; 37(1): 1-15. Ranjbar R, Behnood V, Memariani H, Najafi A, Moghbeli M, Mammina C. Molecular characterisation of quinolone-resistant Shigella strains isolated in Tehran, Iran. J Glob Antimicrob Resist 2016; 5: 26-30. Robicsek A, Strahilevitz J, Sahm DF, Jacoby GA, Hooper DC. Qnr prevalence in ceftazidime-resistant Enterobacteriaceae isolates from the United States. Antimicrob Agents Chemother 2006; 50(8): 2872-4. Oteo J, Aracil B, Alós JI, Gómez-Garcés JL. High rate of resistance to nalidixic acid in Salmonella enterica: Its role as a marker of resistance to fluoroquinolones. Clin Microbiol Infect 2000; 6(5): 273-6. Hakanen AJ, Kotilainen P, Pitkänen S, Huikko S, Siitonen A, Huovinen P. Reduction in fluoroquinolone susceptibility among non-typhoidal strains of Salmonella enterica isolated from Finnish patients. J Antimicrob Chemother 2006; 57(3): 569-72. Hakanen A, Kotilainen P, Huovinen P, Helenius H, Siitonen A. Reduced fluoroquinolone susceptibility in Salmonella enterica serotypes in travelers returning from Southeast Asia. Emerg Infect Dis 2001; 7(6): 996-1003. Akinyemi KO, Coker AO. Trends of antibiotic resistance in Salmonella enterica serovar typhi isolated from hospitalized patients from 1997 to 2004 in Lagos, Nigeria. Indian J Med Microbiol 2007; 25(4): 436-7. Prats G, Mirelis B, Llovet T, Muñoz C, Miró E, Navarro F. Antibiotic resistance trends in enteropathogenic bacteria isolated in 1985-1987 and 1995-1998 in Barcelona. Antimicrob Agents Chemother 2000; 44(5): 1140-5. Crump JA, et al. Reevaluating fluoroquinolone breakpoints for Salmonella enterica serotype Typhi and for non-Typhi Salmonella. Clin Infect Dis 2003; 37(1): 75-81. Sjölund-Karlsson, M., Plasmid-mediated. 2010. Ferrari R, Galiana A, Cremades R, et al. Plasmid-mediated quinolone resistance by genes qnrA1 and qnrB19 in Salmonella strains isolated in Brazil. J Infect Dev Ctries 2011; 5(6): 496-8. Ghaima k k, HHH, Alkhafaji HM. Detection of qnr resistance genes in ciprofloxacin and nalidixic acid resistant Salmonella spp. Isolated from stool samples. Int J Adv Res 2016; 4(3): 577-83. Lunn AD, Fàbrega A, Sánchez-Céspedes J, Vila J. Prevalence of mechanisms decreasing quinolone-susceptibility among Salmonella spp. Clinical isolates. Int Microbiol 2010; 13(1): 15-20.